B-25J No. 43-36128 engages a Imperial Japanese Army Ki-43 Hayabusa “Oscar” fighter over the Kuriles prior to its loss. North American B-25J-10-NC Mitchell No. 43-36128 of 11th Air Force, 28th Bomb Group, 77th Bomb Squadron, based on Attu, Aleutian Islands was lost in action on December 29, 1944. 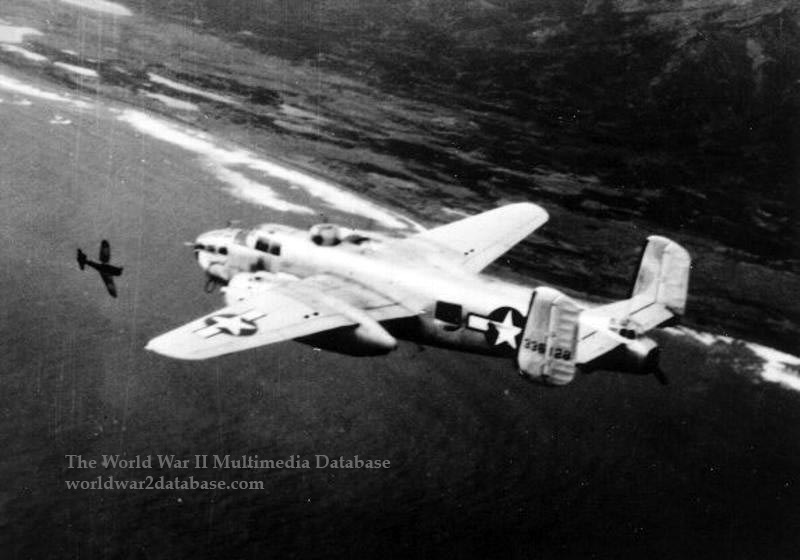 One of four B-25s assigned as fighter decoy during a photographic “offensive sweep” of Suribachi Airfield on Paramushiru, Kurile Islands (now part of Russia), the B-25 flight was working with Consolidated B-24s and United States Navy Lockheed Venturas to photograph the island. Suribachi was an auxiliary airfield for the Imperial Japanese Army. The B-25s were armed with three 500-pound (226-kilogram) general purpose bombs. Second Lieutenant Robert “Bobby” Collier piloted B—25J 43-36136 which was also lost that day. The other two B-25Js aborted and returned to Attu safely. The Pilot of 43-36128 was First Lieutenant Douglas E. Banker (1918 – December 29, 1944) enlisted on April 10, 1942 in New York City. A native of Litchfield, Connecticut, Banker was awarded the Purple Heart Medal, Air Medal with Oak Leaf Cluster, and the Distinguished Flying Cross. Co-Pilot First Lieutenant John H. Franks (May 26, 1920 – December 29, 1944) enlisted on December 13, 1941 in Fort McPherson, Atlanta. A native of Spartanburg, South Carolina, Franks was awarded the Purple Heart Medal, Air Medal, and the Distinguished Flying Cross. Bombardier First Lieutenant Jack B. Evans (1919 – December 29, 1944) enlisted on April 7, 1941 in Detroit, Michigan. A native of Detroit, Evans was awarded the Purple Heart Medal, Air Medal, and the Distinguished Flying Cross. Engineer Officer Captain Archie L. Cathie (July 26, 1900 – December 29, 1944) joined the Army Air Corps before the war and was promoted to Technical Sergeant in 1940. He served with the 20th Air Base Squadron at Nichols Field, Luzon, Philippines before returning to the United States and was posted to the 28th Bombardment Group. A native of Detroit, Cathie was awarded the Purple Heart Medal. Radio Operator Technical Sergeant Frank W. Poplin (1921 – December 29, 1944) enlisted on July 29, 1942 in Fort Bragg, North Carolina. A native of Mocksville, North Carolina, Poplin was awarded the Purple Heart Medal, Air Medal, and the Distinguished Flying Cross. Assistant Engineer/Gunner Staff Sergeant Michael P. Spillane (1922 – December 29, 1944) enlisted on September 10, 1942 in Fort Francis, East Warren, Cheyenne, Wyoming. A native of Casper, Wyoming, Spillane was awarded the Purple Heart Medal, Air Medal with Oak Leaf Cluster, and the Distinguished Flying Cross. Gunner Private First Class William N. Travelbee (1924 – December 29, 1944) enlisted on June 24, 1942 in Kalamazoo, Michigan. A native of Muskegon, Michigan, Travelbee was awarded the Purple Heart Medal, Air Medal, and the Distinguished Flying Cross. Lieutenant Leonard Kupersmith, flying another B-25 that safely returned, radioed Lt. Banker that he was executing a 180-degree turn to head back to base, and Banker responded “Roger,” but 33-36128 and 43-36136 were never heard from again. The plane failed to return to base. No search was conducted. The entire crew was listed as missing in action and declared dead on December 29, 1945. The planes were last reported at 51°35'00.0" N 161°40'00.0" E, midway between Attu and Paramushiru, but Japanese records indicate the planes crashed near Suribachi airfield. Date approximate.